Various visible markings for the identifi - cation of your vehicle. A. Vehicle identifi cation number (VIN) under the bonnet. This number is engraved on the bodywork near the damper mounting. B. Vehicle identifi cation number on the dashboard. The VIN is indicated on a self-destroying label affi xed to the driver's centre pillar. This label is affi xed to the driver's centre pillar. - the spare tyre infl ation pressure, - the paint colour code. Wheels which are fi tted with 205/45 R17 tyres cannot be fi tted with snow chains. 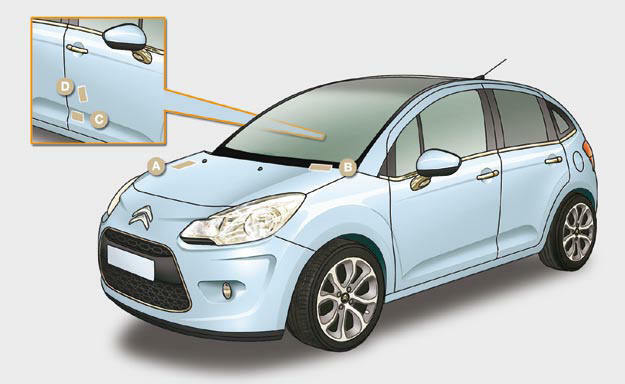 For further information, contact a CITROËN dealer. The infl ation pressure must be checked when the tyres are cold, at least once a month. If the infl ation pressure is too low, this increases fuel consumption.